Delhi Deputy Chief Minister Manish Sisodia released Delhi Statistical Handbook – 2015, created by Directorate of Economics and Statistics and as per the current statistics, Delhi citizen earns highest among all states in India. With a per capita income of Rs 2,40,849 or Rs 669 per day, Delhi is right now #1 state in generating income for its citizens. 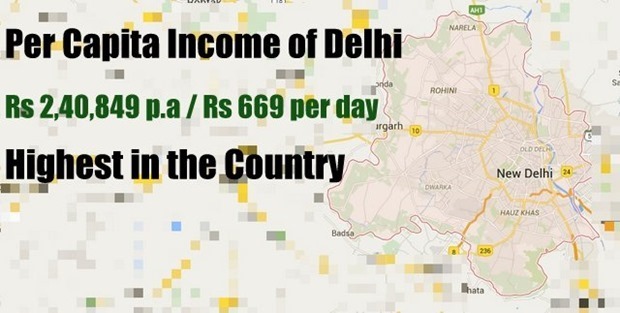 Compared to 2013-14, per capita income in Delhi has increased by Rs 28,630, thereby witnessing an increase of 13.5%. Comparably, Goa had a per capita income of Rs 2.24 lakh/yr in 2013-14, which made them the richest state in the country. Considering that stats for 2014-15 is not available, Delhi can claim to be the #1 state as of now. Puducherry, which is a UT, had per capita income of Rs 1.75 lakh/yr, which is the closest Delhi has compete to. Among other states, Tamil Nadu with per capita income of Rs 1.28 lakh is #2, and Uttrakhand with Rs 1.15 lakh is #3. With Rs 96,199, Arunachal Pradesh is fast catching up, whereas Andhra Pradesh has Rs 90,517 per capita income. As per the recent data, Delhi has 4.54 crore active mobile phone users as of 2014-15, which has gone up from 4.26 crore last year, thereby adding 28 lakh or 7671 new phones per day in last one year. Interestingly, the number of landline phones in Delhi has also increased to 31.23 lakh in 2014-15, compared to 31.04 lakh in 2013. There has been a considerable decline in total number of male and female teachers in polytechnic colleges in Delhi. Male teachers have reduced from 580 to 552, and female from 339 to 280. You can access the complete Delhi Statistical Handbook – 2015 here. "At Rs 20,070/Month, Delhi Beats All States In Per Capita Income [Delhi Statistical Handbook]", 5 out of 5 based on 2 ratings.